While the GAO’s headline grabbing result that the corporate effective tax rate is just 12.6 percent is based on faulty analysis, what would it mean if it were true? For starters, it would mean we could lower the statutory corporate rate from the current 35 percent to 12.6 percent and still raise as much tax revenue if we just got rid of all those pesky corporate loopholes. Wow! That’s what I call blank-slate tax reform! It would mean reform would be easy, and not require years of Congressional debate. It would mean we could match Ireland for the lowest corporate tax rate in the OECD, and we’d have to defend ourselves against charges of being a tax haven. It would also mean we effectively are a tax haven already, since corporations look to the effective rate for investment decisions. That means all the talk of profit shifting to other countries to avoid the high U.S. tax rate is just talk, if you believe the GAO analysis. It would mean the U.S. is already in a very competitive position, with one of the lowest effective corporate tax rates in the developed world. It would mean the U.S. economy is stagnating for another reason entirely. The U.S. has the highest statutory corporate rate in the developed world and one of if not the highest effective rates. 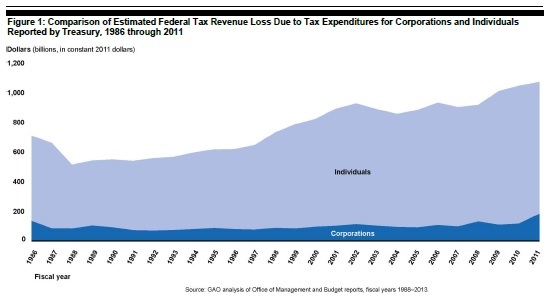 Corporate tax expenditures are relatively small and eliminating them will not pay for a rate much lower than 25 to 28 percent, in static terms. Most of the money is from bonus depreciation and deferral, which are necessary incentives for investment. There has been zero growth in corporate tax breaks in real dollar terms since 1986, ranging between $100 and $150 billion. Meanwhile, tax breaks for individuals have grown from about $700 billion to $1.1 trillion. (see chart below, from an informative GAO study) Much of this growth on the individual side is from the growth of employer provided healthcare benefits, and the fact that we exclude it from taxation. Also, the earned income tax credit and child credit have grown through multiple policy expansions. Together, these tax expenditures alone amount to $225 billion, counting only lost income tax revenue, not additional losses of payroll tax revenue. That’s about what it would cost to eliminate the corporate tax all together, again in static terms. In dynamic terms, counting the economic benefits, there is no need to “pay” for a corporate rate cut, since it would boost investment and economic growth dramatically, leading to more personal income and more tax revenue from that income.